Swedish author Stieg Larsson’s famed crime novel is about Mikael Blomkvist, a financial journalist who once held a steady professional life, only to watch it crumble before his very eyes. Everything seems hopeless until a Swedish industry tycoon offers Blomkvist a way out, but there is a catch: he must a year investigating a disappearance that has remained unsolved for about four years. With few options to take Blomkvist reluctantly accepts and enlists the help of Lisbeth Salander, the girl with the dragon tattoo, to help him crack the case. Since June 2013, the novel has sold over 15 million copies. While receiving mixed reviews, The Girl with The Dragon Tattoo had won some awards in Sweden and Britain. Criticism was directed at the book’s poor conclusion following the promising beginning and middle sections. Another condemnation was the book’s Swedish title, Män som hatar kvinnor (literally “The Men who Hate Women”), underlying the sexual politics of the author. Wonderful novel worth reading it. 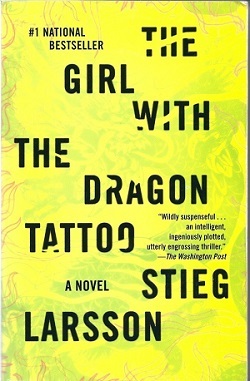 The drama serious of the GIRL WITH THE DRAGON TATTOO is also available.